Living Gluten and Dairy Free with French Gourmet Food: A Practical Guide is written by Alain Braux, a French chef with a degree in holistic nutrition, who is also the author of How to Lower Your Cholesterol With French Gourmet Food. Braux began writing this book to help his clients and others with gluten intolerance, however he recently discovered that he is gluten intolerant as well. He says that just because you have to follow a special diet this does not mean you can’t eat delicious food. This book is designed to provide gluten intolerant individuals with tasty gluten free dairy free recipes and practical advice that will enhance general health and assist in the recovery from a variety of digestive disorders including Irritable Bowel Syndrome. Braux explains the differences between gluten sensitivity, allergy, intolerance and Celiac Disease as well as how to go about testing for these conditions. He also outlines their possible causes, which may include contributing factors such as heavy metal exposure and the overuse of antibiotics. Guidance is provided on how to prepare your kitchen to start a gluten free dairy free life and how to avoid cross contamination with gluten containing foods. Braux points out that if you are extremely sensitive to gluten you need to be aware that some foods labeled as gluten free may actually contain a small amount. Comprehensive lists of foods to avoid as well as foods to keep on hand are provided. Advice is also included regarding how you can find products that are certified to be gluten free and dairy free. Braux shares his tips for eating out, grocery shopping, making adjustments at work, traveling and socializing on a gluten free dairy free diet. Additionally he gives advice on how to spot hidden sources of gluten in personal care items such as toothpastes and over-the-counter medications. Additionally dieters are given information regarding how to cope with withdrawal symptoms that can occur when gluten and dairy are eliminated. Braux also explains what you can do if you are not feeling better after you have been avoiding gluten for some time. The foundation of the book is a large selection of gluten free dairy free recipes for items such as breads, cakes, cookies, soups, salads, meat, poultry, fish, side dishes and desserts. Braux also explains how you can make simple adjustments in your favorite recipes to convert them to gluten free and dairy free. Gluten free grocery items, rice, buckwheat, millet, quinoa, oats, legumes, unflavored ground coffee, plain nuts, seeds, rice milk, soy milk, coconut milk, soy yogurt, non-hydrogenated soy margarine, fresh fruits and vegetables, grass-fed meat, fish and shellfish, grass-fed or free-range eggs, olive oil, coconut oil, macadamia oil, wine, brandy, rum, vodka, gin. 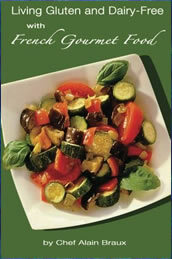 Living Gluten and Dairy-Free with French Gourmet Food: A Practical Guide retails for $19.95 . Provides comprehensive guidance about gluten free dairy free diets. Includes gluten free dairy free recipes for breads, cakes, muffins, cookies and other items. Encourages the intake of fresh fruit and vegetables, whole grains, legumes, nuts and seeds. Encourages the use of extra virgin olive and coconut oils as a replacement for butter. Some of the gluten free dairy free recipes are high in sugar, fat and calories. Living Gluten and Dairy Free with French Gourmet Food provides a large selection of recipes and practical advice for those who need to follow a gluten free and dairy free diet due to a food allergy or intolerance. Dieters should be aware that some of the gluten free dairy free recipes, especially the desserts are high in sugar, fat and calories so these foods should be limited, especially if cardiovascular disease, diabetes or weight management is a concern.